All tracks previously unreleased, transferred from tapes of the Helmut Brandt estate. Background noise or slight tape hiss can be heard in parts. A combo established itself in the league of the German jazz elite: the quintet of the baritone saxophonist Helmut Brandt. Whoever heard their music on late summer evenings could recognize a correlation to the character of the nightly "earty autumm"-mood: Dark color with lighter accents, pensiveness and light movement. In fact, the "sound" of the group is the first striking thing. It is based, of course, once on the choice of instruments: baritone saxophone (Helmut Brandt), trumpet ("Conny" Jackel), piano (Ludwig Ebert), bass (Klaus Gernhuber) and drums (Hans-Dieter Taubert). This, however, does not define the nature of Brandt's music, because the line-up is finally in no way unique or particularly outstanding. It should be noted, however, that each instrument - and that is not self evident in the world of jazz - is treated as such in its very own character, without any unusual sound effect or no real jazz intonation. Crucial to the originality of the sound is the harmonic treatment of the instrumentation, the merging of the melodic lines in the arrangements of Helmut Brandt, which - replaced in this case by the piano - might have been written for 5 or 6 horns and ensure particular variety and depth of sound. "More head, less legs" is Brandt's battle cry. This means that he is less concerned with emotional than with witty music. About what is happening in the field of contemporary music, he keeps constantly up to date and believes that jazz can get a further boost mainly by influences from art music, a predominantly formal enrichment however. His role models are Miles Davis and Bob Graettinger. Now he writes a jazz suite, which is strongly accentuated rhythmwise, but has no continuous "beat". "I know that I am opposed to many," says Brandt, "but I think that the Jazz should be absolute music". The titles are merely subsequent labels. Helmut Brandt is from Berlin, born on 7th of January 1931 in the former imperial capital. At the age of 10 he learned to play violin and mandolin, 1947, he took up the guitar and eventually clarinet and tenor saxophone. In 1949, he helped to open the Berlin jazz club “Badewanne” ("bathtub") with his amateur band. After all, he was at that time already studying music intensively at the conservatory (Klindworth-Scharwenker) and since 1950, Brandt is a professional musician now. 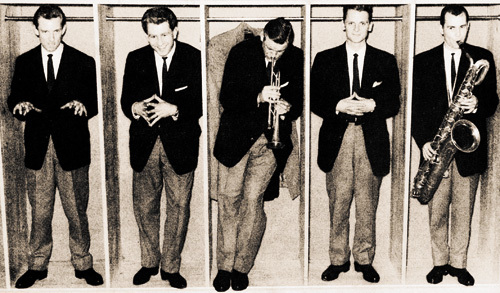 He played tenor saxophone and clarinet, among others in the orchestras of Lubo D'Orio and Kurt Widmann, where he first took over the role of the wild man on the “jumping” tenor saxophone, then under the influence of Stan Getz, and for a while particularly from Gerry Mulligan, noticeably cooled down and finally became an admirer of Lee Konitz. 1951/52 he played for the Americans in Nuremberg and then many gigs as a sideman or with his own bands. Still, he played tenor saxophone, though he already owned a baritone. But he lent it to somebody, already since 1950. Despite all the insistence the colleague made no move to return it (because it was a good horn). Finally - in September 1954 - it came back into the hands of his master, but only after Brandt has threatened to sue him. Helmut Brandt quickly proved that he needed the baritone, because he used it very often and finally chose it as the main instrument (no reason now to lend the tenor!). That he knows how to handle it, should be seen quickly. On first of March 1955, he put together the combo and attended the German Jazz Festival in Frankfurt on the third of May. There he was responsible for the big surprise: Helmut Brandt was reffered to as the new discovery. The combo did not come together by coincidence, rather, they emerged from a septet, which had existed since January 1954, and had mainly performed blues and jump. Later the band has gone through the one or other line-up change and also played "special arranqements" with electric guitar in a swing style. Already in late 1954 the smaller group started to play modern jazz, which then led to the distinctive personal style and a lot of attention. And the final line-up of the Helmut Brandt Combo was found - they came up, played and thrilled the audience. The first vinyl EP records by the Helmut Brandt Combo were released on Metronome and have been getting some much deserved attention. ("Jazz from Berlin": Sum - Berlin Calling - Salute to Lars-Gullin - Breeze and I, except for the last track all Brandt “originals”). 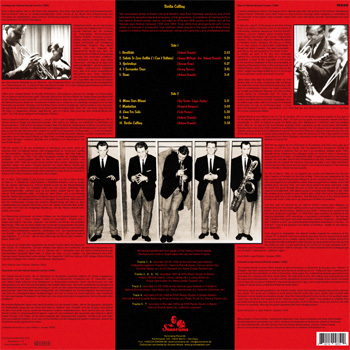 In 1956 there were concerts (in addition to the ongoing bookings), AFN recordings, a successful participation in the German Jazz Festival once again and more recording sessions (Jazztone: "Yesterdays" and “Friedrich`s Lied”, an original Brandt composition dedicated to Fritz Rau, "11 x 50 km" - that is the distance from Berlin to Frankfurt - written for the festival, and "Berlin 56"). From August to September, the Brandt Combo inspired the audience at the "Studio 15" in Munich, then the Frankfurt jazz fans had the opportunity to listen to the ensemble at the "Hobby" during October. On 31st of October and first of November the Helmut Brandt Combo will play as representative German band at the "Salon du Jazz "in Lyon and then go on a DJF-tour through Germany (DJF = Deutsche Jazz Föderation). From December 1956 to February 1957 Helmut Brandt and his colleagues get into the Berlin “Badewanne” ("bathtub") again. 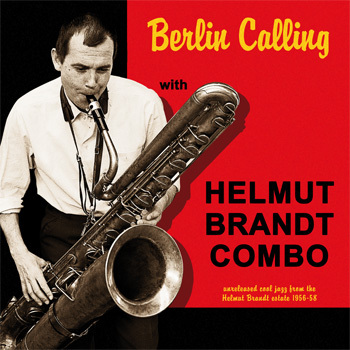 The Helmut Brandt Combo, which played its last performance in December at the jazz club “Atlantic” in Stuttgart, has been produced for the last time during its existence at the “Treffpunkt Jazz” (meeting point jazz) of South German Radio on 12th of December. Once again, this outstanding German jazz band could persuade the audience with their lovely timbre, the high level of play, the mature solo performances and the captivating arrangements. One also had the opportunity to notice the versatility of the combo members and to discover the secret of Brandt`s historical background of jazz, within sophisticated arrangements on a basis of typical swing contributions that are rarely heard. With deep regret we said goodbye to the Brandt Combo, which has become representative of the German jazz scene. The group will continue to exist without Brandt under the name "Berlin Jazz Quintet" with trumpeter Conny Jackel as a leading soloist. Once the Helmut Brandt Combo will be in the spotlight again when they reunite for the occasion of the “German Jazz Salon” in Berlin. The question is whether they will finally belong to the past, but no one wants to basically confirm this today. Even Jay and Kai had their reunion on occasion, although the grave speeches had been already spoken. Many thanks to Klaus Scholz, Julia Brandt, Ekkehard Jost, Gudrun Endress and Sepp Werkmeister. artwork: Patrick Haase, album conceived and produced for Sonorama Records by Ekkehart Fleischhammer.